Artistic AT reader Joanne Croke was inspired by the beauty of an iconic outback NSW landmark on a recent trip to Mungo National Park. I pack my sketchbook, pencils, camera and clothes. 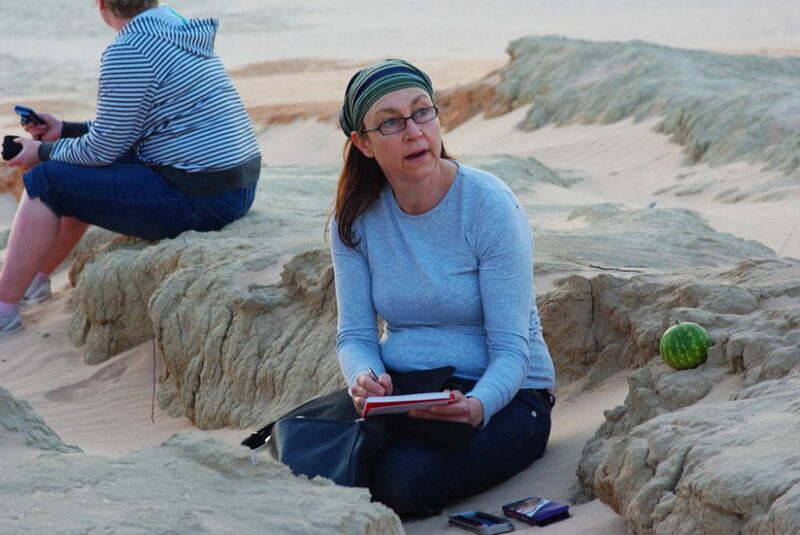 My destination is Lake Mungo in the Willandra Lakes region of NSW, just north of Mildura, where I will collect new material for an art exhibition. 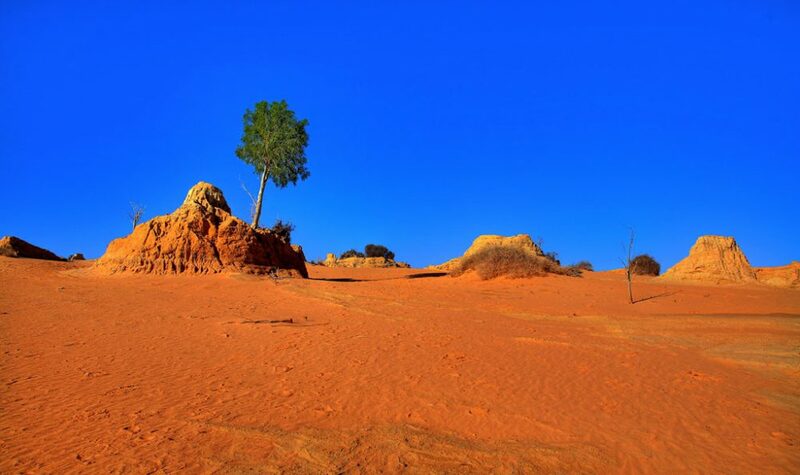 I have always wanted to go to Lake Mungo, a dried lakebed walled on one side by sand dunes called the Walls of China. I want to see the country of long-gone Mungo Lady and Mungo Man – the remains of whom provide evidence of Aboriginal habitation as far back as 40,000 years. They set the scientific world abuzz when they were discovered in 1968 and 1974, because the two skeletons showed that Australian human habitation predated that of Europe; the dates were comparable to African civilisations. From the airstrip, it is a short walk to the four-star Mungo Lodge, where we devour a wonderful lunch for about $20 each. French manager Jacques Barichard (along with his wife Catherine) has brought his lifetime of expertise as an hotelier and chef to the outback, and for that I am very grateful. The Mungo Lodge restaurant has a cathedral ceiling, a 5m-tall clinker brick chimney and open fireplace. Its forged metal firescreen has decorations reminiscent of the twiggy bush, and on the mantelpiece is a long twisted stick that reminds me of a snake, evoking parched desert beauty. Outside are faded branches bleached by the beating sun. Some parts of this restaurant are rustic but others sparkle. The spotted gum floor is so polished it looks like water you could dance on. White leather, chrome-framed chairs glisten against deep-brown wood. 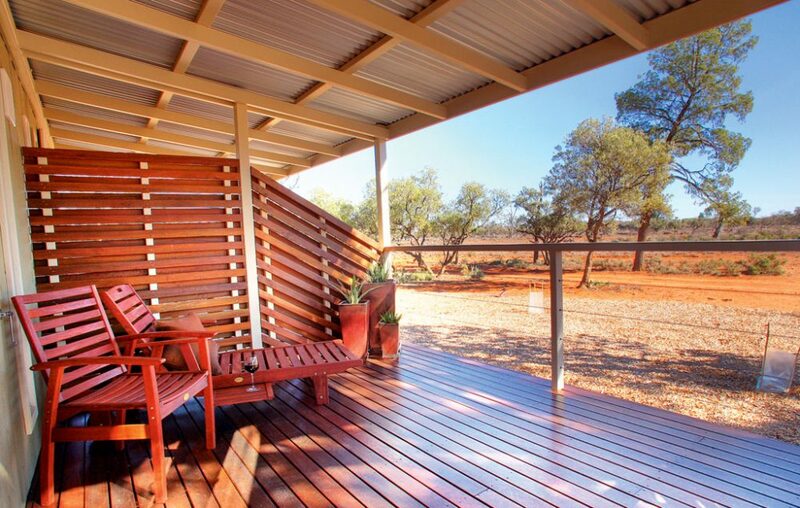 Mungo Lodge has a wide, welcoming verandah overhung by native trees punctuated with bird feeders. Jacques is a passionate ornithologist, and a telescope and comprehensive bird list sit inside by the soft chocolate leather sofas. Outside the large windows, grey-green saltbushes are scattered like cushions over the red desert. The spring landscape, normally just red sand, abounds with delicate desert wildflowers thanks to extraordinary rainfalls – up to 500mm by last February. The countryside seems endless, with pastel green tints and purple hues. I look longingly at my sketchbook. At 3.30pm, Trevor Hancock from Murraytrek 4WD Adventures greets us with a huge outback smile. He takes us to visit the Mungo Homestead Visitor Information Centre, Mungo Woolshed, the original Zanci homestead site and the 33km Walls of China – formed from rock sediments and sand dunes. Since the big rains, the Walls of China are only accessible with an official guide. There is not one plant that Trevor can’t name, from edible bush tomatoes to bitter native almonds, which Aboriginal mothers used to rub on their breasts to wean their babies. Trevor’s stories enrich our experience. The visitor centre has plenty to teach, too, about prehistoric times, the sheep stations and the development of the national park. Outside, the majestic 1800s woolshed is an indisputably beautiful example of bush engineering, made of enormous cypress logs and clad in slats. I think about the station’s previous workforce, the Paakantji, Ngyiampaa and Mutthi Mutthi Aboriginal tribal groups who knew their country so well and helped Europeans settle here. These people were later taken to live in missions, and were dispossessed of their land about the time the woolshed was being built by Chinese labour. The Walls of China, we learn, were a freshwater lake deposit fed by Willandra Creek. The sand dunes constantly shift with the wind, annually moving up to 3m east. Trevor points out a hairy-nosed wombat skeleton embedded in the sediment; later a petrified forest and an ancient Aboriginal fireplace. We walk up the dunes, observing animal tracks on the soft, wavy sand surface. We survey flat, expansive desert country, and descend through a passage of gullies walled by stacks of compacted sand. Later, as we watch the sunset, I settle into the pink sands and finally have a chance to draw. I work my way through the pencil tin as the sandy stacks change from yellow to grey to purple, blue, pink and finally orange. Mungo Lodge and its environs are definitely a get-away-from-it-all location. I am inspired to get up at dawn and create something new in this luxurious and contemplative place. 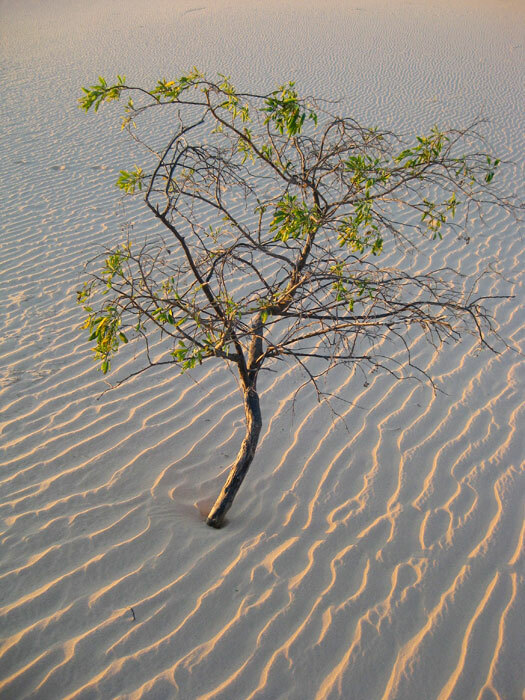 Mungo National Park is in Willandra Lakes World Heritage Area, in outback NSW. For more information on what to do in the area, go to visitmungo.com.au. Joanne recommends Murraytrek Outback 4WD Adventure Tours (www.murraytrek.com.au) and the food at Mungo Lodge (mungolodge.com.au).